The CISA Elettrika rim lock is the evolution of the traditional rim lock taking gate security to a new level. Now users of the Elettrika can experience even greater peace of mind, better ease of use and well-designed style. The rotary hook dead-bolt has a pull resistance of up to 2,000 Kg: up to six times that of standard locks. 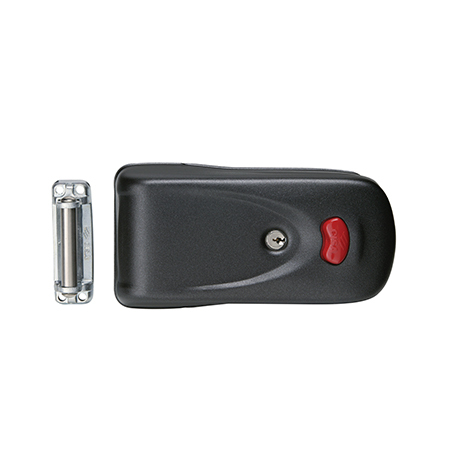 The protective steel case prevents accessibility to the lock’s internal components when the gate is closed. The Elettrika guarantees consistency of operation for more than 1 million opening cycles. Elettrika perfectly matches any type of door or gate shape and style. The Elettrika has been independently tested by gate manufacturer, Oriental Art and shown to be highly resistant to attack by crowbar. See video here.